UK, 2006, 118 minutes, Colour. Ioan Gruffudd, Benedict Cumberbatch, Nicholas Farrell, Albert Finney, Michael Gambon, Romola Garai, Stephen Campbell Moore, Rufus Sewell, Ciaran Hinds, Toby Jones, Sylvestra Le Touzel, Bill Paterson, Jeremy Swift. It is said that the hymn Amazing Grace is the best known in the English-speaking world. Most would not know that it was written by a ship’s captain, heavily involved in the 18th century slave trade, who experienced a conversion and devoted his later life to prayer and reparation. His name was John Newton – and he is played most movingly here by Albert Finney. However, the focus is on the anti-slavery campaigner, William Wilberforce. He is played with intensity and conviction by television’s Captain Horatio Hornblower, Ioann Gryffudd. And he is supported by a fine and extensive British cast including Michael Gambon as Lord Fox, Benedict Cumberbatch as the young Prime Minister, William Pitt, Rufus Sewell as the activist the Rev. Thomas Clarkson, Ciaran Hinds as the arrogant Lord Tarleton of Liverpool and Romola Garai as Barbara Spooner who eventually married Wilberforce. Most audiences will find Amazing Grace a significant cinema experience. Its style is very much the British heritage recreation of a period, a meticulous presentation of period, costumes, décor and the atmosphere of the times – which culminates in a moving brass band rendition of Amazing Grace. But, what will be important for audiences is the theme of the inhumanity and injustice of slavery and the fact that the plantations of the West Indies and the Americas depended for their prosperity on slave labour and the urban wealth of the 18th century metropolises, especially those in Britain and America, was based on slavery. 2007 sees the 200th anniversary of the Act for Abolition of the Slave Trade throughout the British Empire, although the final Slavery Abolition Act was not passed until 1833, the year of William Wilberforces’s death. This makes the film immediately relevant, especially as questions about the need for apology from government, of justice for those who still live the consequences of this trade, are canvassed and argued. The movement against slavery was not something that cropped up and achieved its goals over night. It took decades. And this is what this film portrays. 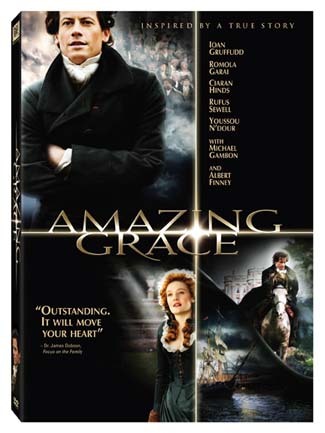 One of the arresting features of Amazing Grace is its presentation of Christian faith, convictions and action. Wilberforce as a child knew John Newton and his history and repentance. There are two moving sequences when Wilberforce visits the ageing and later blind Newton (who declares that he once was blind but now he really sees). Amongst the movement for the abolition of slavery were a number of religious ministers and Quakers. Wilberforce himself contemplated moving out of parliamentary life for prayer and solitude but was persuaded by Newton that faith needed action. Wilberforce is a fine example of something that is very difficult to find these days, a man who brings his faith into public life. The film opens in 1797, fifteen years after he began his crusade. He is unwell, is prescribed laudanum to ease the pain of his colitis. But, it is at this juncture, he meets Barbara Spooner, a strong-minded subscriber to his ideas and ideals. She encourages him to go on with his campaigns and he finds his voice again. The film moves back to the 1780s and traces the collaboration between William Pitt who was to become Britain’s youngest prime minister and who, in principle supported his friend from Cambridge days. While there are sequences showing some of the horrors of the slave ships and the sometimes frantic meetings conducted by Wilberforce and his group, some of the most interesting sequences are in the parliament with the heat of debate illustrating the self-interest and lack of compassion of so many members, many of whom were indebted to slavers and businessmen. Wilberforce was a statesman, a man of honour – and a prophet for his times. 1.A historical film? A film with social conscience? From the United Kingdom – for British audiences? For countries involved with the British Empire? With slavery? 2.The title, John Newton and his composing the hymn? His experience, conversion? Its being sung during the film? The brass band and the playing of it for the ending? The significance of the lyrics – in terms of slavery? In terms of Newton’s own blindness and seeing? 3.Recreating the 18th century, the end of the century? The time of the French Revolution, the Napoleonic wars? Britain and its status? Life in London? The scenes in the parliament, the churches? The countryside and the estates? The roads? Costumes and décor, the score? 4.The structure of the film: 1797, Wilberforce tired and ill, his dreams, the couple taking care of him? The kindness of the Thorntons? His dreams, meeting Barbara, regaining his new voice? The flashbacks and his memories, and his continuing to tell Barbara the story of his endeavours? 5.Wilberforce as young, his ideals, his friendship with William Pitt, the background in Cambridge, their friendship, in parliament, the running together? Wilberforce and his visit to Newton, Newton and his simplicity of life, his sackcloth, mopping the floors? His wisdom? Knowing Newton in his childhood? The evangelical background? At home, well off? His servants and their consideration? His lying on the ground, the question of God and vocation? His integrity? 6.Pitt and Wilberforce in politics, in the parliament, the speeches – and Wilberforce’s witty retorts? His concerns, illustrated by his attack on the men flogging the horse? His concern about people? The quality of his speeches, his reputation? The comparisons with Pitt, Pitt’s character, their running together, their discussion about the strategy for Pitt to be prime minister, his achieving it? 7.The parliamentary sequences, the Duke of Clarence and his being in parliament, his arrogance, son of George III, on the side of the slave owners? His later admitting that Wilberforce was a fine man? Lord Tarleton, with the Duke of Clarence? His Liverpool background, newly rich, interest in slavery? The presence of Lord Dundas and his dilemma, the interviews with him, his trying to compromise? Lord Charles Fox and his interchanges with Wilberforce, his sitting and listening? The behaviour, the questions, the taunts? 8.The issues of slavery in the 18th century, British concern, British exploitation, the ships, the slaves, the slave masters, the cruelty? Audience knowledge of the history of slavery? The importance of introducing Equiano and the African perspective? Newton and his action? The visuals, Wilberforce’s dreams? Wilberforce and the group taking the trip on the Thames, the smell, his speaking to them from the Madagascar? The urgency for Wilberforce? 9.The organisation for the followers of Wilberforce, the few in number, the Quakers, the Anglicans, the people with religious background? Hannah More representing women? Tarleton and the background of commerce and the clashes? The ministers? John Clarkson and his strength of character, bluntness? Thornton and his attendance? The attendance by Fox, Fox being on-side? His listening, helping with the strategies? James Stephen as the secretary? 10.Clarkson, his rough style, intensity, sitting watching the parliament, the rebukes by the parliamentarians? His enthusiasm about the French Revolution, his going to France? Wilberforce rebuking him and not wanting to be a revolutionary? Clarkson’s return, with James Stephen, Stephen and his experience in the Americas? The background of the war of revolution? The strategy as regards the ships, flags? Bringing it to parliament, the boring talk? Clarkson and his coming into the parliament and alerting Tarleton, Tarleton trying to round up support? His meeting with Fox – and Fox having given tickets to the races so that the opponents would be absent? 11.The opposition, the continued defeats of the bill, the toll on Wilberforce’s health? 12.Thornton and his wife, care, the laudanum, Wilberforce’s nightmares? Their matchmaking, the dinner, steering Barbara towards Wilberforce and Wilberforce towards Barbara? 13.Barbara Spooner, a woman of the 18th century, strong minded? Her first reaction, disdain of Wilberforce, upset with the Thorntons? Agreeing to talk with him, listening to his ideas, agreeing with everything? Their going out, falling in love, her listening to him all night? Marriage? The children? 14.The character of Richard the butler, always in attendance, his respect for Wilberforce, over the years, the other servants? His advice? 15.The build-up the passing of the bill? The legal strategies? Fox and his assistance? Tarleton and his desperation? The vote? The acclaim in the parliament? 16.Fox’s final speech, his praise of Wilberforce? Wilberforce’s acknowledgment of this? His continuing to fight for social causes until his death in 1833?